With four math and computer science degrees from MIT, including a PhD, under his belt, Chief Technology Officer of KAYAK, Giorgos Zacharia is a leading expert at applying the hot topics of data, analytics and machine learning to the real world of travel. As one of the world's top travel sites, KAYAK's objective is to build the best app for the user to search and find the travel product that they're looking for and then manage that travel even after the booking experience. In the name of building a better user experience by learning from data, Giorgos spends most of his day working with the product people, the mobile team and the UI development team performing experiments, monitoring the performance and brainstorming on how to improve the user experience. Giorgos has said that user experience even trumps monetization, "At the end of the day KAYAK choses the best user experience that has the highest monetization for our partners and for us." With the two key priorities of speed and personalization, KAYAK is a prime example of using data, analytics, machine learning and predictive analysis to provide timely, relevant, personalized and valuable information for users that keeps them coming back for more. 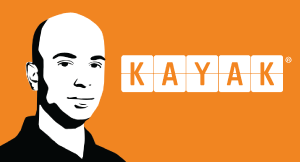 Machine learning plays an important role in the work and the data science at KAYAK. Giorgos describes machine learning, the computer learning patterns from data, as basically computational statistics: "You can have a statistician have hypotheses and test them one at a time, or you can have a computer testing millions of hypotheses in very little time and tell you which pattern has the most predictive value." Practical applications for leveraging machine learning at KAYAK include learning how to better query their partners to find users the most competitive flight prices or how to better personalize when they present it to users by learning their preferences and showing them the hotels they are most likely to book higher than three or four pages after the first page of results. Giorgos says, "We aggregate the information and try to present it in the most usable way. User experience counts for almost every decision that we make at KAYAK, so we try to show our users the most comprehensive results as possible for their travel search query in the most usable way, whether that's a mobile device or desktop." $ Book, cancel, rebook: Because most hotel rates are actually fully refundable if you cancel them, if you see a price that you like go ahead and book it and then if it's cheaper you can cancel and rebook. $ Register for private rates: A lot of KAYAK's partners are increasingly adding private rates, and KAYAK is using these rates for their registered users. 2. Optimization matters - The role of KAYAK and their mission is to produce the most competency and accurate data. If they don't, they lose credibility and the user won't come back. They also want to present results as fast as possible. For example, it makes no sense to have a very complex set of results that might be saving the user a couple of dollars when we know we can get the traveler there with a better flight. "We capture every single click that happens from KAYAK and every single tap that happens in our mobile apps. We see what gets used in what sequence and optimize it over time to save the user time," says Giorgos. "These optimizations matter because you don't want to make the user wait unnecessarily for a result that they will never book. On the hotel side, we don't want to be querying our partners for every single query and make the user wait for 30- 40 seconds depending on the slowest system that we actually have to query. So we have a predictive cache mechanism that anticipates what our users are likely to search every day. We proactively query all our partners, gather that data locally and send those results as fast as possible from our own cache," explains Giorgos. By maintaining in constant direct contact with the customer and by constantly monitoring the usage of the website and pruning all the features that are not valuable ensures that there is that optimization, keeping them focused on customer experience innovation. 3. Personalize for the user - Aside from the ongoing challenge of performance and always striving to make the system faster, another challenge KAYAK is focused on is personalization. According to Giorgos, "If we know the user prefers non-stop flights for shorter flights from Boston to New York, we don't need to preselect the one stop and two stop flights for the user, especially if they are only modifying the dates. We know the context of that search. If the user has shown preference to particular brands or types of hotels, it's important that we actually personalize for that user, so personalization in the way that we chose to present the results matters both on mobile and desktop, so that is also an ongoing focus." Similarly, the results they show to the stranded traveler may be different than the aspirational searches. Speed and personalization never end; it is ongoing work that KAYAK is always focused on. 4. User experience rules - Any idea they have at KAYAK, from minor things like changing the color or size of the platform, or deciding how much information will show in the results page versus when the user clicks to see the different data, to a major website re-design - it is all done through the lens of the user experience and the presentation of the data matters. $ Be flexible: If you can depart a day earlier or later or you are willing to use any airport you can save significantly on the ticket price. $ Monitor prices: KAYAK provides tools like price alerts, where if you are flexible on the time of year you want to fly to a specific tourist destination for example, you can have KAYAK monitor the prices for you. $ Book early: Look early and when you see a price that you are willing to pay, then you should book it, don't wait. KAYAK measures the user engagement with each part of the website - how fast they can find what they are looking for. Secondary to user experience is how much money they make. "At the end of the day, we chose the best user experience that has the highest monetization for our partners and for us," says Giorgos. 5. Use predictive analytics to ensure accuracy - KAYAK relies on predictive analytics for personalization, price forecasting, hacker fares and building new products. One product is a flight price predictor where they give users a forecast of whether the cheapest price that they see on their flight results page is likely to go up or down in the next seven days. They also give the user a confidence metric based on how accurate their machine learning has been in making a call in similar patterns. In observing the data they can see how in some cases the user can save money or even travel time by combining non-aligning airlines, so they show the users this result that they call "hacker fares". It requires two separate bookings but it can save the user significant money or time or both. KAYAK also actually removes results that they think are no longer available and when the user clicks through to end up on a partner's website, they rely on predictive analytics for personalization. 6. Capture the right data and measure it correctly - "The big challenge is to capture the right data and make sure you actually measure it correctly," advises Giorgos who says that they have spent a lot of time at KAYAK optimizing their platform to actually do the right types of segmentation and give them statistically reliable data. "Occasionally we might do an experiment that doesn't capture the right type of data, so it requires constant attention and diligence in asking the right questions when you see data that doesn't make any sense," he shares. 7. Build for mobile first - Aside from searches for same day or next day flights which signals a travel problem where users are stranded and they need a car or hotel right away, the mobile patterns are actually identical to the desktop which means that people are using it as a desktop replacement. With more than half of their users on mobile devices, KAYAK strives to make sure that in that small screen they provide as much functionality as possible. "Our design is already mobile first, so we have the mobile design team coming up with the next iteration of the redesign of KAYAK and then the desktop expands for the whole of KAYAK. We make sure that increasingly our desktop experience is touch optimized, so mobile is truly driving the identity of KAYAK on all the devices," says Giorgos. The transition to a multi-device world, as users start their searches on mobile and then end up booking on a desktop or the other way around is what keeps this CTO up at night: "We need to make sure that we support that use case as well as possible, but I don't think we have cracked it well yet and I don't think anybody else has either." You can watch the full interview with Giorgos Zacharia here. Please join me and Michael Krigsman every Friday at 3PM EST as we host CXOTalk - connecting with thought leaders and innovative executives who are pushing the boundaries within their companies and their fields.